Given by Lin Barkass, Opal Ltd.
Cover sleeve for a 12" long-playing record of Between Tides by Roger Eno. The cover design is a photograph of an original cement, acrylic and collage painting by Russell Mills. 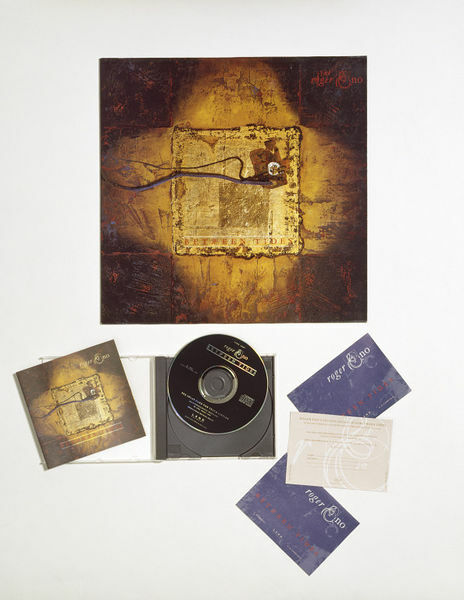 It includes three promotional adhesive stickers, each lettered with 'Roger Eno / Between Tides' the Land Records logo and catalogue numbers of the LP and CD against a blue ground. Lettered with title, credits and 'COVER: BETWEEN TIDES BY RUSSELL MILLS DESIGN AND ARTWORK: RUSSELL MILLS AND DAVE COPPENHALL'. Land Records formed part of the Opal Group of Companies. Founded in 1984, Opal represented Brian Eno, Daniel Lanois, John Paul Jones, Jon Hassell, Harold Budd, Roger Eno, Michael Brook, Laraaji, and visual artists Russell Mills and Andrew Logan. Opal not only encompassed many aspects of the music business such as music publishing, artist management, record production and its own label, Land Records, but was also involved worldwide in video and art installations, concert promotion and book publishing. Since 1991 Opal concentrated solely on music publishing and Brian Eno's own work. 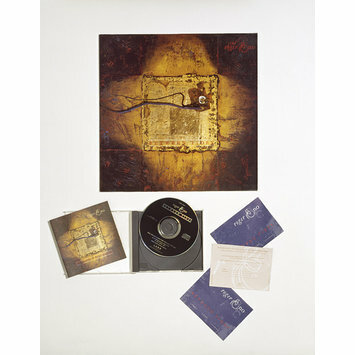 Cover sleeve for a 12" long-playing record of 'Between Tides' by Roger Eno, with three promotional stickers. The cover design is a photograph of an original cement, acrylic and collage painting by Russell Mills. Colour offset lithograph print on cardboard. Photograph by Jeff Veitch. Designed by Russell Mills and Dave Coppenhall. Issued by Land Records, great Britain, 1988. Edge, Kevin. The Art of Selling Songs : Graphics for the Music Business, 1690-1990. London : Futures Publications, 1991. The inner-sleeve and vinyl record are E.1590 and 1591-1990 respectively.